Ah, Monday... who likes you? I don't and I certainly don't like thinking about having to go home and figure out what's for dinner right after work. Which is why I love how easy fish tacos are. They are seriously a staple in my home. The BF and I make them weekly. Why? Because they are SO easy and fast. Not to mention healthy and delicious. Win-win. My secret to fish tacos is that I use frozen fish fillets and a bottle of blackening seasoning. We buy our fish from Costco, but most grocers carry a pack of frozen fish fillets. We like mahi, but tilapia, cod, and salmon work too. You can also make my best ever Tequila Lime Shrimp Tacos. They take a little more work in that you marinate the shrimp, but they are worth it. You can use flour or corn tortillas, but I must recommend the Tortilla Land brand that you cook yourself on the stove. They are amazing and only 60 calories a piece. You can also add any toppings you like. We usually add pico de gallo, lettuce or cabbage shreds, and guacamole. Costco also has little 100 calorie Wholly Guacamole packs that are great for tacos. So you see? You can have a super easy, healthy, delicious meal and hardly spend any time cooking. Just thaw the fish for about 15 minutes, throw on some blackening seasoning, and grill it up on the stove. You can heat your tortillas at the same time and voila! Dinner is served. Don't you just want to take a bite of these? I like to add salsa or my chipotle crema sauce and I'll provide that recipe below. 1. Thaw fish fillet for 15 minutes in room temperature water or until completely thawed. 2. Preheat a skillet with a few tsps canola oil on medium high heat. 3. Sprinkle thawed fish with blackening seasoning to evenly coat. 4. Pan fry fish on on each side for 3-4 minutes or until evenly cooked. Fish will be white and flaky when done. 5. While fish is frying, heat a skillet/griddle on high heat. 6. Add tortillas and grill for about 1 minute per side. 7. Add half a fish fillet per tortilla and any toppings you desire. For the chipotle crema: Blend pepper and yogurt together until completely blended. You may need to add a little milk to reach desired consistency. I like to put mine in a squeeze bottle, but you can also dollop it on your tacos like sour cream. So I was going to make regular ole' spaghetti, but then I got inspired to do something more creative. I was also sick all weekend and finally had the energy to cook. If you know how labor intensive a lasagna is, but really love those cheesy Italian flavors, then this is the recipe for you. 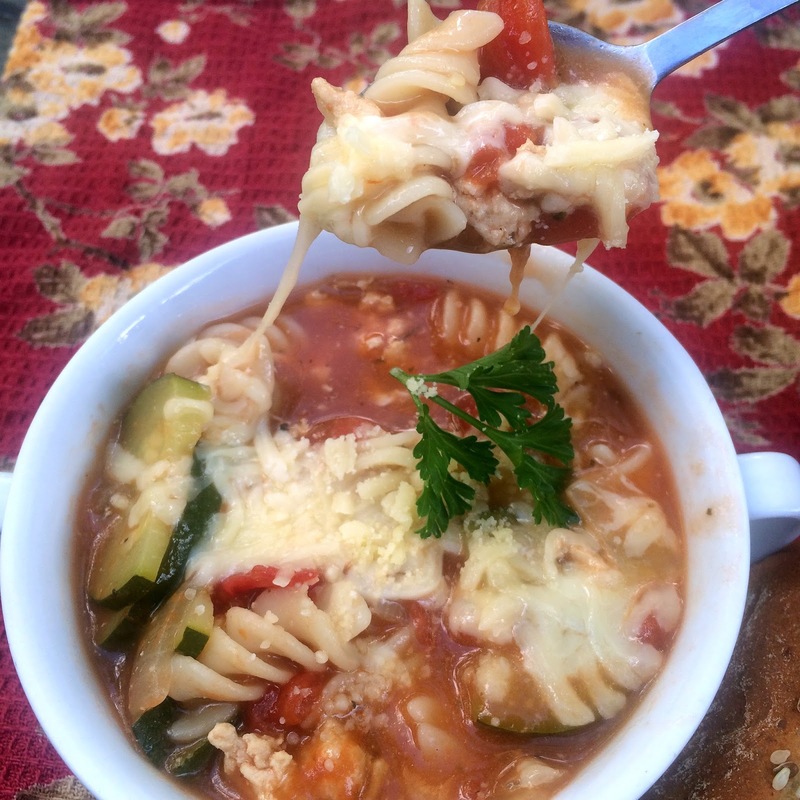 One Pot Skinny Lasagna Soup. One pot, 30 minutes, lean, and delicious. Now that it's starting to be chilly in some parts of the country it's comforting to have a hot and savory bowl of soup. You can easily make it vegetarian by leaving out the meat or carnivore-friendly by adding ground beef or Italian sausage. For an easy meal that's sure to please a crowd (and make everyone say "Mmmm" when they walk in the door), you should definitely try this recipe. 1. Heat oil in large pot and add onion. Cook until translucent. 2. Add garlic and stir in for about 1 minute. 3. Add ground turkey and cook until fully cooked. 4. Add tomato paste and Italian seasonings and cook for 1 minute. 5. 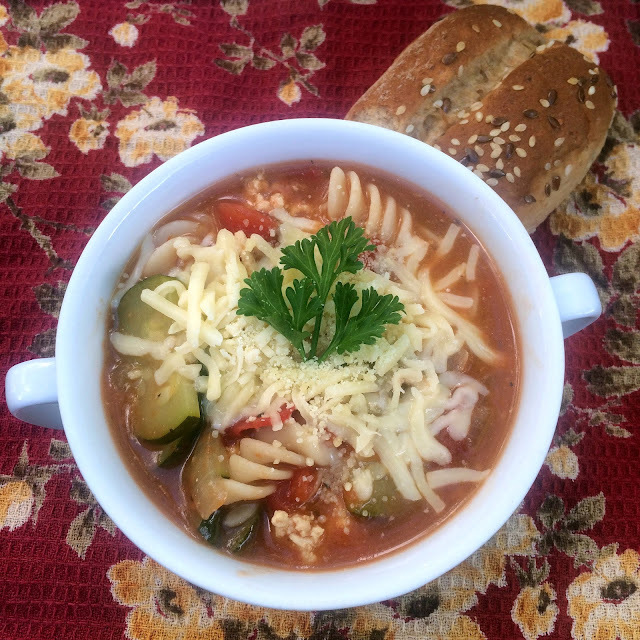 Pour in chicken broth, diced tomatoes WITH LIQUID, zucchini, pasta, salt and pepper. 6. Let simmer for 10-14 minutes until zucchinis and noodles are cooked. 7. Serve with cheese melting on top.